"Perry was fantastic to work with. He was very responsive when we had questions. He provided a worksheet that made it easier to put the day together and was incredibly flexible when we changed things up on him. He was so fun throughout the wedding, I know all of our guests had fun with him. It was a great experience working with him." "If you're looking for the best wedding DJ out there, LOOK NO FURTHER!! Perry is hand's down the best wedding DJ I've ever had the pleasure of knowing! He was the DJ at our friends wedding, and when my Wife and I decided to tie the knot, we knew we had to have Perry be part of our special day! Perry and Krista were extremely kind, flexible, and insightful throughout all of our planning. He even helped us out with our ceremony! And the dance party at our reception.......SO MUCH FUN!!! He absolutely brought the hose down!! His lighting and equipment are professional grade, so the mood can be perfectly set!! We would recommend Perry to anyone looking for a amazing dance party to celebrate their marriage!" "If I could give Perry 10 stars I would. In the beginning stages of planning my wedding, finding a DJ that understood our vision and didn't expect us to pay an arm and a leg seemed like it was going to be the most stressful piece. Then I found Perry! From the first time I reached out to Perry he was by far the fastest responding vendor I have ever encountered via email which I absolutely loved. Whether his email was just confirming receipt of my email and letting me know he would get back to me I always felt acknowledged and knew I would hear back from Perry in record time. Each time he reached out, he just took away so much stress and made this piece of the wedding that much easier. I literally only requested 6 major songs for my wedding (processional, recessional, first dance, etc.) and left the entire cocktail hour, dinner, and reception to Perry. BEST DECISION EVER! Perry made me so comfortable leaving the music selection in his hands. He also brings amazing lighting, speakers, microphones, etc. which are all inclusive of his very affordable and reasonable pricing. I've never seen a wedding where so many people were dancing and commenting on the music the entire time. I would recommend Perry to anyone and can't thank him enough for making our wedding day so special. You are the best Perry!!!!" "There aren't enough stars on this website that we can give to Perry. He was absolutely amazing throughout the entire process from the minute we booked him. Perry has an infectious energy that easily rubs off on everyone that he meets. We were able to tell him exactly the type of music style we were looking for and he delivered perfectly. Since my husband is Hispanic we asked Perry to mix in some Latin music and he included the perfect amount at the right time to keep his family involved throughout the night. Perry's assistant was also amazing. He was out there dancing and interacting with everyone and made the atmosphere even better. For the entire night people were out on the dance floor having the time of their life because Perry does a great job keeping the energy up. We would recommend Perry for any event not just because he's an amazing DJ but because he's also an amazing person to work with. Thanks so much Perry for an amazing night!!" "We had so much fun working with Perry on the music for our wedding! He has such a wonderful personality and really brings the party to life! Right from the get-go, Perry was lightning-fast with his responses and we knew we could trust him to handle all our audio needs for our wedding. He did the audio for our outdoor ceremony and our reception and it all went so smoothly. He also brought some great uplighting to bring just a bit more pizazz to the inside of our barn. Perry is loyal, dependable, and a stellar DJ with the best pricing. Call Perry!! Thanks Perry!!" "We had a ton of fun working with Perry! He had great energy and we had people on the dance floor the entire evening. When we first met with Perry, we did not know what songs we wanted for certain parts of the evening. He was able to talk through options with us and help us figure out what would be best for us. He was also incredibly quick to respond to any questions that we had." "Perry did a great job at our wedding. He was very easy to work with and is incredibly responsive to any messages, usually within 5 minutes. We had a quick meeting with him to go over details and filled out a quick form with the "scheduled" songs as well as a sample list of reception songs. 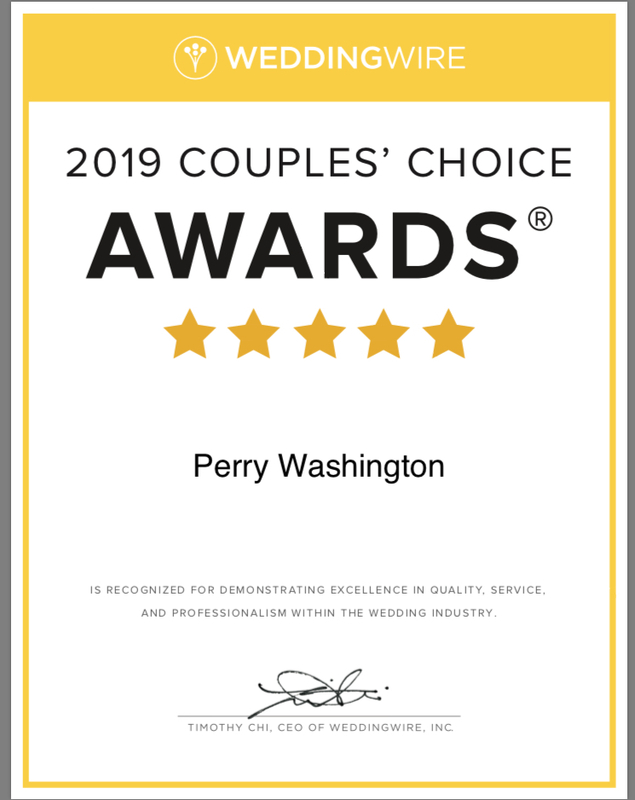 Perry took it from there and kept our wedding flowing smoothly and filled in the rest of the reception time with songs based on our sample list." "Perry was EXCELLENT! We had our wedding at Dunafon Castle which is not the easiest for set up and he did everything flawlessly. Everyone could hear the ceremony, we had microphones, he ever adjusted the sound to each person speaking so it was perfect. He was great at keeping the night moving along and announcing wedding party, speeches, dances, etc. The music was the BEST! He blending everything we wanted from 80s to country to current music and everyone stayed on the dance floor until we were kicked off. Thank you Perry for an amazing night!" "Let me just start by saying....look no farther than the one and only Perry Washington! From day one when we started searching for our wedding DJ, Perry was by far the most responsive and helpful than any other DJ's we contacted. He is a huge part of what made our wedding the best day of our lives. We were able to choose every song that we wanted to have played at the ceremony, cocktail hour, and reception, and he played literally all of them. Not only does he provide the equipment for the music, but he also has microphones for the groom and/or bride, something we definitely wouldn't have thought of on our own. During the reception, my now husband and I didn't leave the dance floor once, and even though I was a sweaty mess at the end, I had the best time of my life. He is a huge sweetheart, fun, and extremely professional. Perry, I don't know how we can ever thank you enough for making our day so special. We will remember you forever!" "Perry is the man!! If you want a DJ who can get the party started and keep people engaged through the whole night, he is your guy! I was so glad to have Perry there to lead us through the night, no one can do the job like he can! Even through some sound system issues with ourvenue, Perry kept everyone's spirits high and kept the party going! He truly understood the kind of music we wanted during dinner and also for the reception. It was a perfect night and a lot of that is thanks to Perry!" "We worked with Perry for our October Colorado wedding at Cherokee Ranch and Castle. Perry was an absolute pleasure to work with and I could not be happier with how our wedding turned out! Perry brings such a positive energy to every room that he is in and he worked flawlessly with our coordinator and photographer to ensure that the wedding flowed just how we wanted it. I was so pleased to see how much our guests enjoyed the reception and Perry played the perfect music to keep the party going. We had multiple requests from our wedding guests for Perry’s contact information because they enjoyed him so much and were interested in using him for their events. It is obvious that Perry truly cares about his clients I would recommend him to anyone!" "Perry Washington is outstanding!! He was hands down the best DJ!! From the moment we reached out to him he was very quick to respond!! He is very reliable, affordable, and definitely brings the party. Everything from the ceremony to the toasts, to the music choice, was absolutely perfect! We had so many people after the wedding come up to us and say how good the DJ was! Thank you so much, Perry, for making our day so amazing." "Perry proved to be a wonderful, reliable, and cost effective DJ. Our wedding was done on a tight budget and Perry fit right in. He kept the party going all night and the ceremony went perfectly. I will say that when he asks what must be played make sure you put a lot of thoughtinto it because many of the songs we requested never played. He did play the ones we told him were must haves but we had another 30 songs we wrote down that we had hoped to hear more of. In the end though he did what a good DJ should and kept everyone dancing. I highly recommend Perry. You'll have a lot of fun working with him and he'll relieve a ton of stress that you may be feeling about your big day." "Thank you, Perry! We were very impressed with him at the first meeting, and things were even better the day of the wedding! I couldn't have asked for a more perfect DJ for this day. He read the guests so well and played to exactly what kept them entertained!" Doing what I love is a dream come true, so with that said, I express my joy through my music, lighting and sound systems. When people hire a DJ it’s a very personal time for them as they are bringing me into their family and friends as someone who will make their event everything they want it to be and more. Weddings are my number #1 love. They’re always about LFGP… Love, Fun and a Great Party! Relatives sometimes travel in from all over the world to celebrate with you on your very special day and there are no do-overs. The music needs to be right, the sound systems also need to be right and most of all my homework has to be done so your wedding or event goes just as planned. Your input and musical taste are very important to me because that day “isn’t” about me it’s about you! So the more that I can represent you the better your event will be (who knows your guess better than you). Lastly, I price my DJ company on an old saying my dad taught me, “All because you’re getting Married doesn’t mean you’re rich”! It means you want to have a great day with your family and friends and one they’ll soon not forget. But also at a price where you know you’re really getting your money worth. That’s why I started and have owned the Master Piece Mobile DJ and Sound Company for many many years as a 5-star company! We can’t wait to provide you with amazing service at your next wedding, birthday party, anniversary, or corporate event. Feel free to give me a call directly or send me information about your event.